Walt Whitman went to Washington in 1863 searching for his brother. He stayed throughout the war visiting wounded soldiers at military hospitals. Walt Whitman arrived in Washington, D.C., in late December 1862, intending to stay for a few days. He wound up staying for the next 10 years. For the first three of those years, the great American poet was a regular visitor to the various military hospitals in and around the nation’s capital, where he devoted himself to bringing cheer and companionship to the thousands of suffering young soldiers confined to their beds with wounds, illness, or infection. By the end of the war, Whitman would personally make more than 600 visits to the hospitals and speak to some 100,000 soldiers during his rounds. In his own humble way, Whitman was also a war correspondent—not on the front lines of the battlefields, but in the rear, where the battles’ true costs were hidden away. Whitman’s time in Washington began with the wounding of his brother George at the Battle of Fredericksburg, Virginia, in late December 1862. Walt was at home in Brooklyn with his mother on the morning of December 16 when he unexpectedly came across a list of regimental casualties in the New York Tribune. Among those listed was “First Lieutenant G.W. Whitmore [sic], Company D.” Fearing the worst, Walt threw together some belongings and hurried south to Washington, where the main Union hospitals were located. 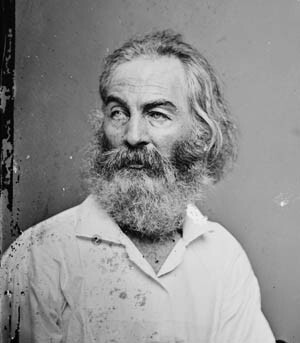 For three days and nights Whitman searched in vain for his brother, trudging from hospital to hospital through streets clogged with dispirited Union soldiers and wild rumors of impending Confederate invasion. The futile period of searching, he told his mother, was “the greatest suffering I ever experienced in my life.” It did not help that Whitman’s pocket was picked in the train station in Philadelphia, leaving him literally penniless. At last someone suggested he go to Falmouth, outside Fredericksburg, where the Army of the Potomac was camped for the winter. There he found George in surprisingly good health, only slightly wounded by a piece of Confederate shrapnel that had pierced his cheek. George, for his part, was unfazed by his close brush with death and glorying in his promotion to captain of the 51st New York Infantry. Ward K, Armory Square Hospital, Washington, D.C., sports flags and holiday greenery, giving it a festive appearance totally at odds with the grim reality of war and wounds. Whitman left Falmouth on December 28 aboard a government steamer bound for Washington. Traveling with him was a large contingent of seriously wounded soldiers headed for the various military hospitals in the rear. During the three-hour trip, Whitman went from man to man, collecting information to send to their families back home. It was the first humble step of a great one-man humanitarian enterprise. One of the men died before they docked at the Sixth Street wharf. Back in Washington, Whitman found part-time work as a copyist in the paymaster’s office, where he saw firsthand the inadequate efforts by the government to aid wounded veterans. Each day he observed dozens of “poor sick, pale, tattered soldiers” climbing up five flights of stairs in search of back pay that was not always forthcoming. Many of the men had been honorably discharged from the Army, but without money to get home they were stuck in the hospitals and convalescent camps, surrounded by sick and dying comrades. Some were reduced to living on the streets. With no particular plan or purpose, Whitman began visiting the hospitals. At first, it was merely to look in on the Brooklyn soldiers he had known before the war, but it soon became a daily routine. In the past, Whitman had occasionally gone to visit injured friends at the Broadway Hospital in New York, but nothing had prepared him for the sights, sounds, and smells of the army hospitals—they were literally a world unto themselves. 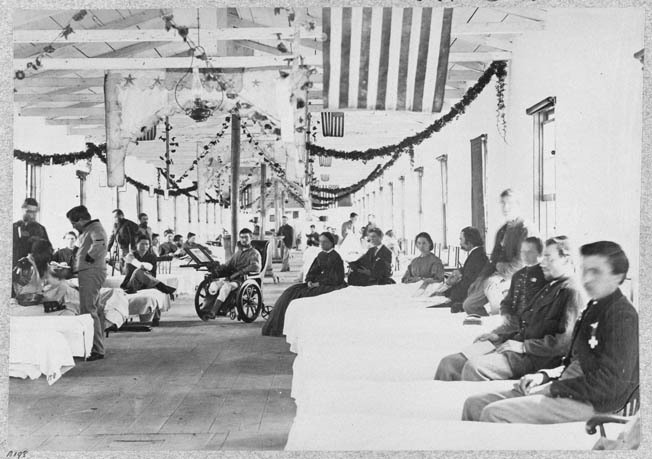 By the end of 1862, there were approximately 35 hospitals in Washington, accommodating some 13,000 soldiers. Walt Whitman, photographed by Mathew Brady in 1862. Sick soldiers could expect little in the way of help from their doctors. Indeed, many of the physicians made matters worse by violating the most basic of all medical tenets: First, do no harm. The doctors prescribed a bewildering and ineffective array of drugs at the first sign of illness. Diarrhea was treated with laxatives, opium, epsom salts, castor oil, ipecac, quinine, strychnine, turpentine, camphor oil, laudanum, blue mass, belladonna, lead acetate, silver nitrate, red pepper, and whiskey. Malaria called for large doses of quinine, whiskey, opium, epsom salts, iodide of potassium, sulfuric acid, wild cherry syrup, morphine, ammonia, cod liver oil, spirits of nitre, cream of tartar, barley water, and cinnamon. When all else failed, doctors harkened back to more medieval methods of treatment: bleeding, cupping, blistering, leeching, binding, and chafing. Wounded soldiers on the grass outside a field at Fredericksburg, Virginia. Many of the wounded would end up in hospitals in Washington, where they either recuperated or died. The predictable result of such hurried and horrific operations was postoperative infection. Pyemia, septicemia, erysipelas, osteomyelitis, tetanus, and gangrene were grouped together as “surgical fevers.” Pyemia, literally “pus in the blood,” was the most dreaded of all, with a mortality rate of 97.4 percent, but the other surgical fevers also claimed their deadly share of victims. Not without reason did Civil War soldiers fear doctors much more intensely than they feared the enemy. They had a greater chance of dying in the hospital than in the field. Whitman prepared for his daily visits as carefully as a general prepared for a battle. He quickly found that outward appearance counted greatly with the men, and so he made it a point to bathe, dress, and eat a good meal each afternoon before starting his rounds. “In my visits to the hospitals,” he wrote, “I found it was in the simple matter of personal presence, and emanating ordinary cheer and magneticism, that I succeeded and helped more than by medical nursing, or delicacies, or gifts of money.” He wore a cheerful, wine-colored suit, a pair of hand-polished black Moroccan boots, and a wide-brimmed hat with a gold-and-black drawstring and gold acorns at the bottom. He told his mother: “I fancy the reason I am able to do some good in the hospitals among the poor languishing and wounded boys, is, that I am so large and well—indeed like a great wild buffalo.” Small-town soldiers from the West and Midwest had never seen a man quite like him. 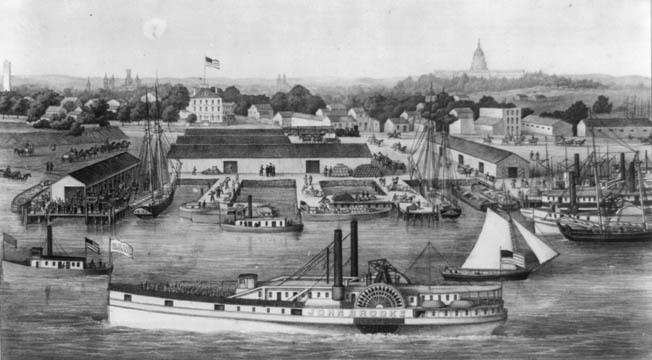 Bird’s-eye view of the Sixth Street Wharf at Washington, where Whitman arrived in early 1863. Wounded soldiers file from the paddle-wheeler John Brooks in the foreground. Realizing that the soldiers needed more than his mere presence to comfort and inspire them, Whitman began bringing a knapsack full of little treats for the men, anything he could beg, borrow, or buy to make their stay in the hospital a little easier. Fruit, tobacco, candy, jelly, pickles, cookies, wine, brandy, shirts, handkerchiefs, clean socks, and underwear all went into his gift bag. During warm weather he sometimes brought ice cream to the men as a special treat. These gifts he distributed quietly and informally, knowing instinctively that the proud young soldiers would automatically resist any hint of pity. He carefully kept track of his gifts in small pocket notebooks, jotting down whatever he had learned from the patients he visited—name, rank, company, regiment, bed number, ward, hospital, nature of wound, and names and addresses of parents and wives. He kept a ready supply of paper and pens on hand for those wanting to write home. If a man was too weak to write for himself, Whitman took down dictation or simply wrote the letter for him. 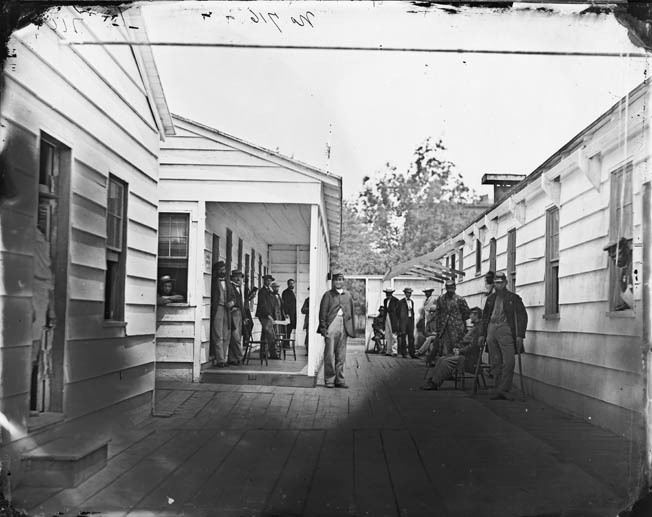 Convalescing soldiers and staff outside a Sanitary Commission lodge, one of 30 such facilities operated by the Commission in Washington during the war. Whitman didn’t think much of the Sanitary Commission. To help finance his visits, Whitman fell back on his prewar training as a journalist. Like many other American writers, he had started working for newspapers as a boy, beginning as a printer’s apprentice on the Long Island Patriot at the age of 12. By the time the Civil War began in 1861, he had worked for 14 different newspapers, mostly in Brooklyn and New York City, but also including a brief stint as editor of the New Orleans Crescent in the late 1840s. Two years before the war, he had lost his most recent newspaper job, as editor of the Brooklyn Daily Times, for writing editorials defending the sexual rights of women. 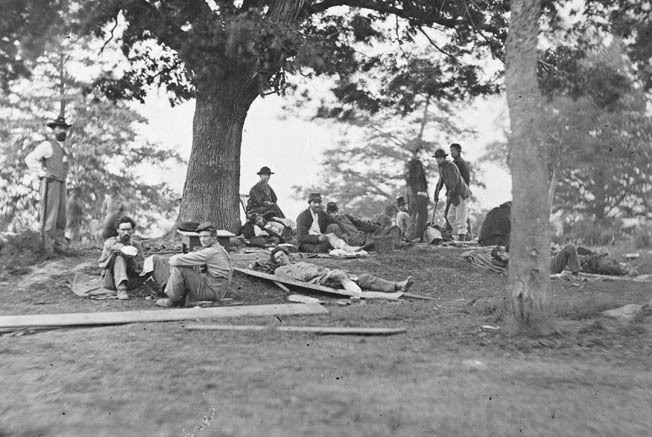 Wounded Union soldiers convalesce near Alexandria, Virginia, in July 1864. The grinding Wilderness campaign that spring and summer filled the hospitals to bursting. Whitman happened to pass Holmes’s bed on his way out of the ward, and noticed “his glassy eyes, with a look of despair and hopelessness, sunk low in his thin, pallid-brown young face.” The poet stopped and made an encouraging remark; Holmes did not reply. “I saw as I looked that it was a case for ministering to the affection first, and other nourishment and medicines afterward,” Whitman wrote. “I sat down by him without any fuss; talked a little; soon saw that it did him good; led him to talk a little himself; got him somewhat interested; wrote a letter for him to his folks in Massachusetts; soothed him down as I saw he was getting a little too much agitated, and tears in his eyes; gave him some small gifts and told him I should come again soon.” When Holmes mentioned that he would like to buy a glass of milk from the old woman who peddled it in the wards, Whitman gave him some money. The young man immediately burst into tears. 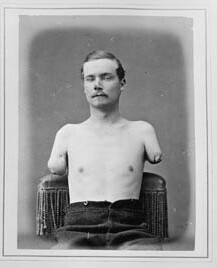 One of the wounded, double amputee Sergeant Warden, as photographed by the Surgeon General’s Office. Mosquito netting hangs above patients’ beds at Washington’s Harewood Hospital in an effort to lessen malaria outbreaks. Of his own voluntary service as a witness to “war’s hell scenes,” Whitman maintained a lifelong modesty. “People used to say to me, Walt you are doing miracles for those fellows in the hospitals,” he told his young disciple Horace Traubel many years later. “I wasn’t. I was doing miracles for myself.” He never lamented his wartime service or what it cost him physically and emotionally. “I only gave myself,” he said. “I got the boys.” Half a decade before the war, he had written in Leaves of Grass, “I am the man, I suffer’d, I was there.” After the Civil War he could truly say that he had lived those words and helped, in his own way, to relieve the suffering. Tags Abraham Lincoln, Alexandria, antietam, Army of the Potomac, Battle of Fredericksburg, Fredericksburg, Mathew Brady, New Orleans, Sanitary Commission, walt whitman.